Today I thought I would show the progress of my "wedding socks." I started knitting them the day before my wedding and have been working on them on and off since then. These socks make me happy for many reasons. Of course, number one being that every time I wear them I will be able to think of knitting them while everyone was getting ready the morning of our wedding. And knitting them on the plane ride to Cabo, and here and there while on our honeymoon. These socks also made me happy because the yarn was gifted to me from Jenni, my knitting BFF. And she picked out just what I like Socks That Rock (in the FemmeBot colorway). 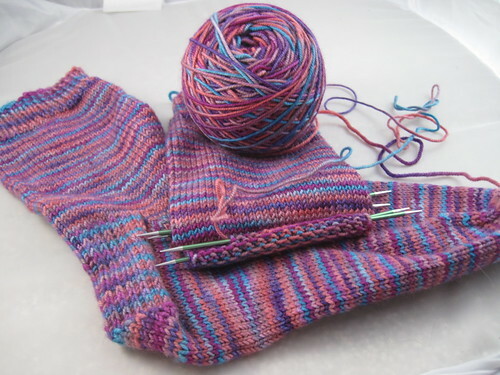 Finally, these socks made me happy because I have achieved happiness with this multi-colored yarn. No crazy pooling or flashing. I think I may have finally found my happy place with the mutli STR yarn. 60 sts. US Size 1. Happy happy WIP. I can't wait to finish these babies!